Ed Allick, 85, died on March 29, leaving a legacy as the former mayor of Oregon City, longtime city commissioner, local teacher, school board member and business owner. Allick often opposed other elected officials on the City Commission but his plain-spoken and sometimes rough-around-the-edges approach was beloved by voters. No one dared file for candidacy against him as he was re-elected unopposed for his fourth and final term of 1999-2002. Gov. Kate Brown has authorized U.S. flags in Oregon City to fly at half-staff from sunrise to sunset on Tuesday, April 9, in memorial of Allick. Always having considered Oregon City to be a working-class town, Allick's early career was spent at the Publishers paper mill, except during the time he was drafted to serve in the Korean War. For decades, he and his wife built the popularity of Allick's Sausage Kitchen on McLoughlin Boulevard in Oak Grove, renamed from the sausage business they purchased in 1969. The first member of his family to graduate from high school, Allick and his brother both worked at the paper mill in West Linn and would mentor youth who were learning to work in the mill. Former Oregon City Mayor Don Andersen, who was "like a brother" to Allick, got him out of the mill and encouraged him to go to college and earn a teaching degree. In addition to their regular teaching duties, Andersen and Allick taught the decorated wrestling program at Gardiner Middle School, which brought decades of statewide awards home to Oregon City. Allick's wife, Edith Allick, was better known as "Mickey" and worked until she was 83 at the sausage kitchen, retiring a couple of years ago to be closer to her ailing husband, who was only four months older than she was. 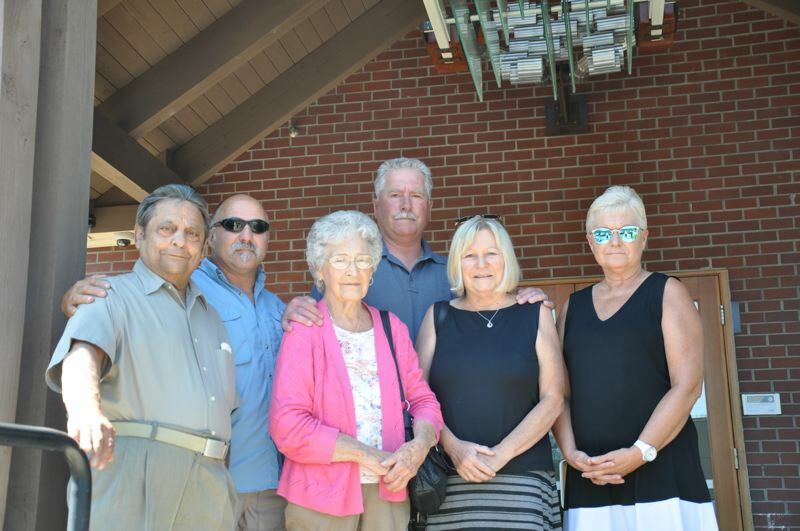 In the 1990s, Ed Allick had to slow his work at the sausage kitchen due to health concerns, but Mickey remained working there so her husband could continue to serve the community with Friends of Mountain View Cemetery and the Oregon City Optimist Club. Their son Nicholas, who now runs the family business, said that his mother loved the customer base, many of whom had been regulars for more than 20 years. "She appreciated the type of smokehouses we have," he said. "You couldn't build them anymore, but they're grandfathered in, and now they all have to be self-cleaning." Nick Allick said his father had battled congestive heart failure for many years, but his mother, who had been in relatively good health, died within 15 minutes of hearing the news of her husband's death. "Mom wasn't really sick — that was the weird part — so she died of a broken heart, I guess," Nick Allick said. "When I told her, she asked to sit up on the bed, and then she leaned into the caregiver and that was it." Allick served his first four-year term from 1977-80, the final year of which he was mayor. Back then, Oregon City's mayor each year was appointed from one of the four commissioners by a vote of each commissioner along with the outgoing mayor. In previous news articles, Allick said he really enjoyed representing the "average taxpayer" despite finding himself at the losing end of plenty of 4-1 votes of City Commission. In 1998, he said that the city's plans for widening boulevards and encouraging local tourism were ignoring the "guy who's struggling down here." Allick described himself as having a "1930s outlook on things" but said he wasn't opposed to change. When Fred Meyer came to town, he and Andersen were prime movers in overcoming opposition to the project, a fact he was always proud of, said John Williams, a former mayor. "I haven't met a man who is more real than Ed Allick," Williams said. "He was very open minded and generous with his time and his money." Allick was a big proponent of turning controversial issues over to votes of citizens, including annexations of property into city limits. In the early 1980s he had advocated for a garbage burner, but the issue was referred to a vote of the people, who turned down the idea. Although the vote disagreed with Allick's perspective, he always respected the voters' decision. In the case of Williams wanting to sell empty lots as surplus property, Allick disagreed and said he would rather that the city retain the properties in order to turn them into parks eventually. Citizens ended up siding against Williams that time, agreeing with Allick's perspective that the lots should remain in public hands. Williams said he always found Allick to have fairly earned his popularity. "When he thought that he had the right slant on something, he would stick to his guns and vote that way," Williams said. "You couldn't walk down the street with Eddie without someone stopping him, wanting to talk with him." For at least the past 15 years, Allick and Williams met weekly at Williams' "office," the Hilltop McDonalds on Molalla Avenue. "We always ordered the same way: 'We'll have two senior coffees, please, and one with one cream,' and that was his," Williams said. Allick was re-elected to a second term beginning Jan. 1, 1981, but resigned from that four-year term on Jan. 6, 1982. He re-entered politics in the 1994 election, serving a full term from 1995-98. He was re-elected for his last term in 1998 but resigned July 18, 2001, due to health concerns. "I served on numerous committees and boards with Eddie, he has led the city in bold decisions and strong vision," said Oregon City Mayor Dan Holladay. "He saw many changes and developments occur in Oregon City and helped guide the progress in making our community the great place it is today." At the time of his resignation, Allick encouraged the younger generation to get involved in politics. "I just wish that some younger people would get involved," he said in a 2001 news story. "I don't think they need guys my age for a hundred years." A viewing for Ed and Edith Allick will be held from noon-8 p.m. Monday, April 8 at Hillside Chapel in Oregon City. The service will be 11 a.m. Tuesday, April 9, at the Tri-City Baptist Temple in Gladstone.